UPDATED: Swedish maritime authorities reported Thursday morning that an historic Norwegian vessel home-ported in Stavanger had started taking in water and later sank in the Baltic Sea between the Swedish islands of Gotland and Öland. Its Norwegian crew was rescued but one person was reported missing and later presumed to have gone down with the ship. The two-masted Wyvern, built as an exclusive 60-foot touring vessel in 1897, was sailing in this year’s Tall Ships Races when it sent out an emergency call at 5:21am Thursday that it was taking in water with 10 persons on board. Sweden’s air and sea rescue service (Sjö och Flygräddningen) sent helicopters to the scene from both Visby and Ronneby as several merchant vessels in the area also diverted course to offer assistance. Five of the Wyvern’s 10 crew members were winched up from the sinking vessel by 6:42am and all were eventually rescued by 8am and flown to Kalmar on Sweden’s east coast. The vessel sank at 9:37am, according to the Swedish authorities. The drama resumed, however, when rescue crews got word that three persons from the Dutch vessel Wylde Swan had voluntarily gone on board the Wyvern in an effort to pump out water and prevent it from sinking. Two of them were later plucked up by a rescue helicopter from the choppy waters in stormy conditions and flown to Visby but one remained missing. Emergency officials reported waves of three- to four meters and strong winds in the area. The search continued for the third man, who was said to be wearing a life vest and survival suit, with both helicopters and other vessels were taking part in the rescue efforts. Emergency authorities called off the search at 12:36pm after it failed to yield any result and after witnesses said the man was bound to the vessel’s rigging when it sunk. The stormy weather prevented divers from going down to the wreckage, which was believed to be lying at a depth of 50 meters. The rescue authorities then turned the case over to Swedish police. The cause of the accident remained unclear and officials at the Stavanger Maritime Museum, which took over the vessel in 1984, said they couldn’t understand how the accident could have occurred. It’s a huge loss for the museum and the sailing enthusiasts who had fully restored the vessel. 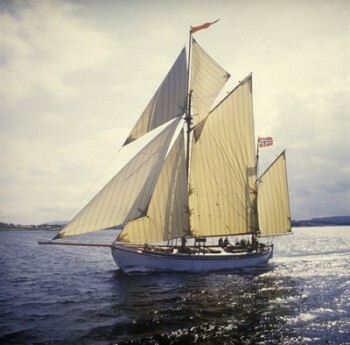 The Wyvern has sailed in several national and international regattas over the years and has won in both its class and for overall performance in previous Tall Ships’ Races, according to the Stavanger Maritime Museum’s website (external link, in Norwegian). The vessel, designed by legendary boatbuilder Colin Archer of Larvik, was originally built at Porsgrund Baatbyggeri as a pleasure yacht for wealthy British timber dealer Frederick Croft who lived at Stathelle, on Norway’s southern coast. He named it Wyvern after the mythological dragon that was featured on his family’s shield. The vessel was later sold to new owners in Kiel, Germany and renamed Tatjana until it was bought by editor Rolf Thommesen of the Norwegian newspaper Tidens Tegn. He renamed the vessel Havfruen (The Mermaid), and sailed her until the vessel was sold to new owners in Great Britain who lived on board and sailed for 27 years after World War II, crossing the Atlantic 12 times and sailing around the world in the late 1950s. 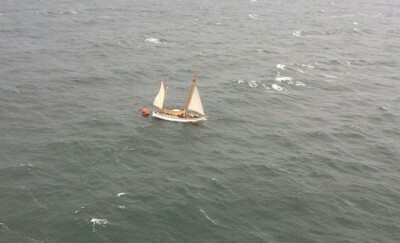 The vessel finally returned to Norway after being found in bad shape in Ibiza in 1978. A group of oil industry executives financed the boat’s full restoration at speciality yards in Stord, Stavanger and Risør and the vessel was given as a gift to the Stavanger Maritime Museum in 1984, officially handed over by then-Crown Prince Harald. It since had crossed the North Sea several times and taken part in five Tall Ships’ Races.